The Ford Expedition is a heavy-duty full-sized utility vehicle that can take on all of your tough jobs. 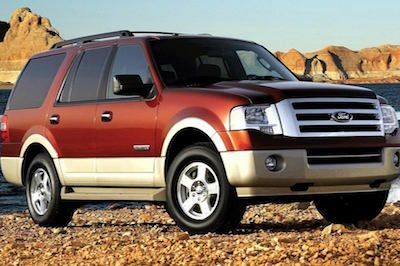 When you need Ford Expedition parts, you buy the best for your vehicle. Choosing FordPartsOnSale.com will ensure that the best is what you get because we deliver only factory original parts. We will never offer cheap imitation replacements. Running Boards - Our selection of original factory running boards will provide function and style to your Ford Expedition. Replacement Interior Parts – Maybe you need to replace broken trim pieces or replace a damaged third row seat. We have the interior parts you need for all Ford SUVs that include your Expedition, Explorer, or Excursion. Accessories - From floor mats to cargo nets, we have a variety of genuine Ford accessories that will make your Ford work for you. We provide quality Ford replacement parts at low prices, but we never charge excessive shipping rates to make up for our reasonable prices. If you have questions about replacement parts for your Ford Expedition, our knowledgeable staff will be happy to assist you. Call us at 585-475-1064. If you already know what you need, use our convenient online parts look-up to place your order 24/7.